The taste for the antique was propagated by a continuous stream of publications, a whole series of works on ancient Greece ant Italy and archaeological studies. It was inevitable that the charming rococo style had to succumb to such an onslaught. In 1770 when Madame du Barry gave a reception for the opening of her new Château de Louveciennes, the most exquisite masterpiece of the Louis XVI style, it was apparent that the Louis XV style had become quite out of fashion, at any rate in Paris, before the death of the king whose name had been given to it. Of course furniture did not all in a year assume the new classical decoration and form. There was a time of transition, in this case a decade, when the new principles were being perfected. As always the ornament was first to respond, then the lines and structure. When the transition to Louis XVI was completed, the structural lines were based chiefly on the rectilinear and the curves of the circle and ellipse supplanted the sinuous curves of the rococo. Straight tapering legs superseded cabriole legs. Much of the grace and beauty were achieved through the perfection of proportions, the faultless balance of all parts, and the harmonious division of the surface into panels and the accuracy of their framing. However, even under Louis XVI some belated pieces, belonging to what is known as the Transition style, had not yet resigned themselves entirely to abandoning their cabriole legs, as may be seen frequently in chairs, commodes, small occasional tables and other delicate tables designed for feminine use. Moreover, all those brilliant and versatile qualities which marked the achievements of Parisian ébénistes under Louis XV were continued under his successor. Little of any importance remained to be discovered in this domain, as we shall see when we consider briefly the work of several great ébénistes. The same woods were used, native and exotic; above all, mahogany enjoyed remarkable favor. Simple mahogany veneers were widely adopted for commodes and the like mounted in gilt bronze. Marbe tops continued in fashion and were carefully chosen for color. Although the furniture of the First Empire differs widely from that of the Louis XVI style, both styles are founded on the same principle, that is, the imitation of antiquity. However, since society from 1760 to the Revolution was as epicurean and wordly as in the first half of the eighteenth century, the original creators of the Louis XVI style applied this principle with considerable discretion and respect for the national taste. Antiquity under Louis XVI was only a fashion; it was to be made French, and if the adherence to classical precedent interfered with comfort and convenience, the former had to yield. For this reason, even though the least educated eye can recognize at first glance a Louis XV from a Louis XVI piece, a peculiar affinity exists between the two styles. Hence, refined simplicity, subdued elegance, and precision softened by an abundance of graceful and delicate ornament are the ideals and essence of Louis XVI furniture. Never in the history of French furniture did the ébéniste display more assuredness in his technique. He displayed this same sureness of taste in his selection of ornament that was sufficiently rich to alleviate the bareness, but within the boundary of deliberate moderation. A marked characteristic of the Louis XVI style is the small scale on which practically all ornament was treated by the woodcarver and especially by the bronze worker. The jewel-like quality of the bronze mounts resembles more the work of the goldsmith than that of the fondeur-ciseleur. Among the many favorite running motif, which also happen to be an architectural bequest of antiquity, are dentils, leaf bands such as acanthus, bay, or oak, bead chains, entrelacs or two interlaced ribbons, guilloches, imbricated coin bands, and, above all, short rows of fluting. Also borrowed from antiquity and incorporated into furniture design are such architectural legacies as pilasters, consoles, and balusters. By far the most important are columns, either detached or more frequently engaged, having a capital, fluted shaft, and turned base, and found at the corners of commodes and other pieces. A celebrated galaxy of ébénistes, from Riesener to Weisweiler, distinguishes the Louis XVI style. Many, like Saunier, Leleu, and Riesener, began their careers under Louis XV. Riesener, 1734-1806, was one of many German craftsmen who went to Paris in the eighteenth century to seek their fortune. After the accession of Louis XVI, they came in even greater numbers, hoping for the favor of the queen. The patronage extended to such ébénistes as Beneman, Weisweiler and Schwerdfeger reveals that they were not disappointed. 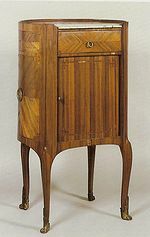 Riesener, like most ébénistes from the Rhineland, excelled in complicated locking devices for transforming furniture, which attained their peak of complexity under Louis XVI. Martin Carlin is also a perfect exponent of this charming Louis XVI manner with its refined and graceful elegance. His exquisite bronze mounts range from very small stylized motifs, such as ropes of beads, to garlands of realistic flowers. Bronze swags or festoons of taseled drapery are typical of Carlin’s style. He was adept in producing small combination pieces, such as combined sewing, writing, and reading tables, which were so common under Louis XVI. Elaborate combinations of rich materials are characteristic of the Louis XVI style, and Carlin, like most of his contemporaries, possessed the technical brilliance to work in the most varied materials – panels of marble mosaics, lacquer or marquetry, and plaques of Sèvres porcelain, generally painted with bouquets of flowers. Chairs of the Louis XVI period are in general more angular than those of the preceding style, and in that respect less comfortable, or at least they appear to be so. On the other hand they are more varied in form and ornament. The basic difference between a Louis XV and a Louis XVI chair is that the former has not a single straight line, while the latter always has at least straight legs. Because of the architectural influence, another major difference is that all the members or parts of a Louis XVI chair are the same time joined and separated by well-defined joints, while a Louis XV chair is composed of continuous curves that flow into one another without any visible separation. The Louis XVI chair frame is simply molded or carved with running motifs derived from classical sources. The back of the upholstered fauteuil may have a variety of shapes. However, irregardless of its shape, if the back is slightly hollowed out, it is said to be en cabriolet. Medallion backs and rectangular backs are especially characteristic. Many are square or almost square. Others have uprights vertical or slanting slightly outward, and the crest rail is arched like à basket handle. Above the leg is usually a square or die, a necessary reinforcement, which is joined to the seat rail and decorated on two sides generally with a square rosette. Chair design under Louis XVI achieved a very high degree of technical excellence. Such menuisiers as Boulard, Foliot, Lelarge, Delanois, Sené, and others brought to their work notable skill as wood carvers. Georges Jacob, 1739-1814, one of the great wood carvers of the eighteenth century, created and executed a wide range of chairs. His work shows the evolution in taste from Louis XVI to Empire. Beds at this period almost invariably had a canopy. The beds most frequently seen are the lits à la polonaise with a domed canopy and the lit à la duchesse, having a rectangular canopy supported from the ceiling. The dossiers of the beds, in most instances, assume the same shapes as those of the fauteuils; they are square or arched as a basket handle. Regarding tables, there was scarcely any novelty to be introduced. A new type, however, was the athénienne. The profusion of athéniennes, cassolettes, brûle-parfum, guéridons, and jardinières born at this time, and which continues until the end of the Empire, is an important feature of the Louis XVI period. The elegant class of secrétaires and bureaux introduced under Louis XV remain in high fashion. Since furniture planned to harmonize with the wall decoration continues as a dominating idea under Louis XVI, such pieces as commodes, bas d’armoires, and encoignures flourished. The façade of many Louis XVI commodes is still decorated as one unit; the division of the drawers is disguised as much as possible. As for the handles, the most frequent form is that of a ring, perhaps a wreath, framing a circular back plate often in the form of a rosette. Deriving from the commode is a new piece of furniture, often known as a desserte, which retains only the frieze drawers. The number of shelves and their arrangement vary considerably; in some models the rear panel is covered with a mirror. Like the commode, they are generally veneered in mahogany and mounted in gilt bronze. A gallery of pierced brass is a novelty of the Louis XVI epoch met with again and again around the tops of tables and on the three sides of marble tops of such pieces as bonheurs du jour, chiffonnières with five or more drawers, one upon another, and vitrines. Toward the end of the reign, around 1785, many pieces of furniture depart from the pure Louis XVI style. Indeed, and this is particularly true of the deluxe pieces such as console tables and commodes made for the royal apartments, a remarkable resemblance can be found in their grandeur and heavy forms to that of the Louis XIV style. The leader of this style is incontestably the ébéniste Guillaume Beneman. Apart from his work, certain ébénistes, unabashed, made copies of Louis XIV pieces. Such are the imitations of the sumptuous pieces of Boulle, with their marquetry of metal and tortoise shell, produced by Montigny, Levasseur, Séverin, and other ébénistes. Other pieces belonging to this period instead of recalling the style of “le Roi Soleil” forecast that of the Directoire and Empire. Certain pieces, such as guéridon-tables, whose forms and materials followed Pompeian tripods very closely, may even be said to belong to it already. This style is more self-consciously archaeological than the pure Louis XVI style, but until the end of the Ancien Régime the grace of sentiment contiued to temper the austerity of archaeology. The ébéniste whose compositions and mounts are most reprensentative of the Pompeian style is Adam Weisweiler, one of the most appreciated ébénistes of this time.